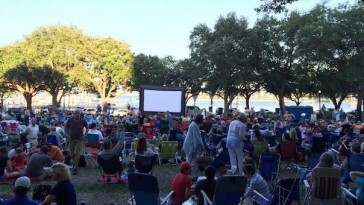 The Tampa International Gay and Lesbian Film Festival (TIGLFF)was founded in 1990 as a multi-day extension of Tampa’s Pride celebrations. The three day event represented three of the areas LGBT organizations: The Tampa Bay Business Guild, Bay Area Human Rights Coalition, Tampa Bay Gay Men’s Chorus. 26 years later TIGLFF is now a 9-day juried LGBT community film festival, one of the largest and longest running of its kind in the world. For the last 25 years the festival has been held at The Tampa Theatre. The gorgeous, internationally renowned theatre has long been a home for groundbreaking cinema. Earlier in the Spring TIGLFF announced a major change to the festival. The opening night, closing and major events of the festival will be held in St. Pete at The Palladium Theater. “Tampa Theatre has been proud to be TIGLFF’s home for the past quarter century, and we wish them nothing but the best as they move forward. Our doors are always open ,” said Tampa Theatre President and CEO John Bell in a release. St. Pete’s world regarded Pride celebration and growing LGBT community was a major factor in the move. “[St. Pete] is a city with a growing commitment to the arts” said reps from TIGLFF. The Palladium’s location in the heart of downtown St. Pete gives the festival new exposure and allows our local community the chance to experience the inspired art of the LGBT community. TIGLFF will kick off on August 26 at freeFall Theatre with a screening of the classic film Funny Face. The screening begins at 7pm. Follow this link to purchase your tickets to the event. The entire festival will launch at The Dali Museum on September 12. The event will feature a cash bar, tapas and exclusive previews of what you can expect at the 26th annual festival. Follow this link to get your tickets. TIGLFF officially begins on October 2. This years event is abuzz with a scheduled performance by Lea DeLaria, known for her starring role as Big Boo on Orange Is the New Black. Opening for Lea will be the locally loved Scott and Patti. The event begins at 6pm at The Palladium Theater. Follow this link for tickets. For up to date information on screenings, visiting directors and ticket deals follow TIGLFF on Facebook and their main website.